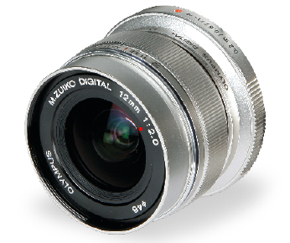 The M.Zuiko Digital ED 12mm f/2 lens is both a step forward and a look back for Olympus, as it has the look and feel of a lens from years gone by yet includes the latest MSC (movie and still compatible) technology for fast and quiet AF operation. The 12mm gives an equivalent of a 24mm field of view, so it’s a fairly serious wideangle lens, yet with an aperture of f/2 and a close focus of 20cm you are able to create dynamic shots with a shallow depth of field. The look really suits the E-P3, as it is compact and resembles a rangefinder-style optic. The focus ring uses an electronic connection, but is weighted to give a very natural feel and is only active when the ring is pulled back to reveal distance guides on the barrel. It works well for landscapes and cityscapes, and is very sharp, although it would be nice to see a 25mm version (giving a 50mm equivalent view). A 45mm f/1.8 prime lens is also to be launched, but wasn’t available at the time of testing. This will be a less expensive lens, though, and is not expected to have the same premium feel as the 12mm. The only slight downside is the price, with the 12mm f/2 due to cost around £600, which is almost the same as the E-P3 itself.